Just like the Nomad, this adorable hobo features ultra soft fringing, giving the purse a fun, playful look. The supple fabric gives this handbag its trademark hobo slouch, making it a great way to complete your carefree boho-chic look. The chic twisted handle adds interest but that’s not all. It’s also designed to sit comfortably on your shoulder or in the palm of your hand, allowing you to easily carry this beautiful bag every day. 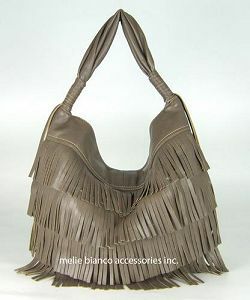 The Melie Bianco fringe hobo retails for a mere $80, a fraction of its high-end designer muse. Just think what you could do with that extra spending money!